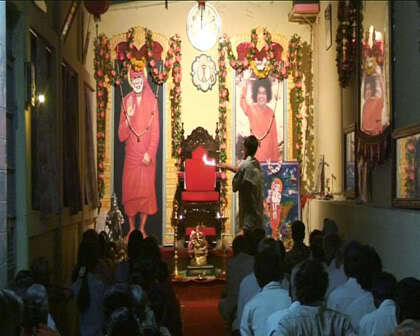 In His previous incarnation Sai Baba was known as Shirdi Sai Baba. The one most beautiful name Sai Ram, is also known as Allah. Take pity on us, bless us and guard us, Lord. The one most beautiful is Sai Ram. A Bhajan & Aarti sung to ‘Sai Natha’ (abhisheka to the Lord Sai) by a local school group in the back-streets of Puttaparthi in preparation for Ganesh Chaturthi Celebrations. Global Akhanda Bhajan, the timeless intonation promoting Universal Peace and Harmony is one of the most significant and far-reaching annual spiritual exercise initiated by Bhagawan way back in the mid forties. Ever since, every second week-end of the month of November has been a fixed schedule for this 24 hour marathon non-stop bhajan saga. O Auspicious, Beautiful and Elephant faced Lord, with the one tusk, You are the Lord to be worshipped First, before starting any function. You are worshipped by the Saints and Sages. 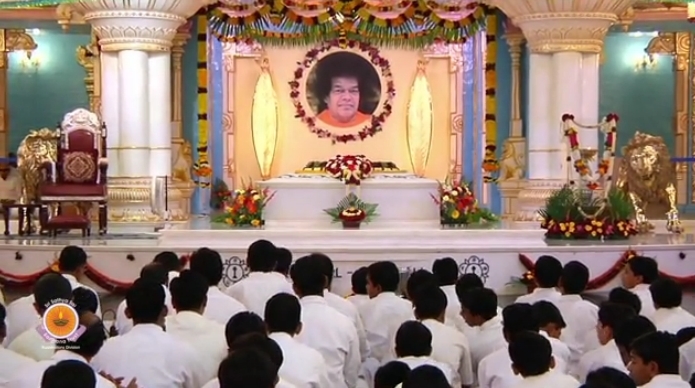 Glory to our Lord and Teacher Sathya Sai who is our true Guru and Lord. Surrender at the Feet of the Guru. Surrender at the Feet of Brahma. Surrender at the Feet of Vishnu. Surrender at the Feet of Shiva. Surrender at the Feet of Sai. Bow and surrender to Lord Shiva. Great stealer of hearts, who moves in Brindavan. The cowherd boy with the flute who lifted Govardhana mountain, Captivated the hearts of the Gopis and is Radha’s Lord. Love is God; God is Love. Every second is Sai. God is pleased when we recite any one of His names like Ram, Rahim, Krishna, Kareem, Zorastra, Jesus and Nanak. God is Love. Chant the names of the Lord…Rama, Hari, Nanak, Govinda, Allah, Maula and Sai. O! Sai Rama most compassionate Lord. You are the bright light in the temple of my heart.